Putin met with Patriarch Kirill of Moscow and All Russia. 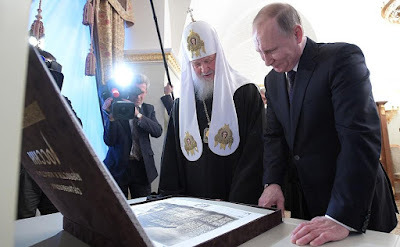 Putin.BLOG Religion Putin met with Patriarch Kirill of Moscow and All Russia. Russian President thanked the Patriarch for his contribution to developing dialogue between church and state, and wished him further success in these endeavors. Mr. Putin presented the Patriarch with a collection of 17 engravings, Mediaeval Fortresses and Monasteries of Russia, by Russian graphic artist and engraver Igor Zadera. 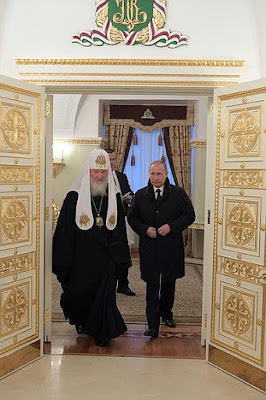 Vladimir Putin with Patriarch Kirill of Moscow and All Russia. Russian President presented the Patriarch with a collection of engravings, Mediaeval Fortresses and Monasteries of Russia, by Russian graphic artist and engraver Igor Zadera. 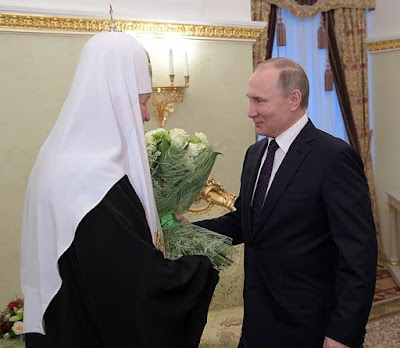 Vladimir Putin and Patriarch Kirill of Moscow and All Russia. 0 Comment to "Putin met with Patriarch Kirill of Moscow and All Russia."